All the Drawings or Paintings are judged on the basis of ICE-PAPA approach (Innovation, Creativity, Engaging, Perfection, Age of Artist, Presentation and Artistic Ability). Currently, all art contests are CLOSED. Eligibility: 6 to 19 years old. It is so Simple. Draw, Submit & Win . . .
PICASSO ART CONTEST is an international online art contest which is open for all children of age group 6 to 19 years old. However, some art contests are for 2 to 6 years old too. It has been started to motivate artistic and creative minds. The participants are from 69+ countries including USA, UK, INDIA, UAE, MALAYSIA, etc. This website has amazingly attracted art lovers from 129+ countries. Paintings submitted must be artist's original work. If your painting infringes upon another's copyright, it will be disqualified. Please do not send painting related to violence, drugs, or adult themes. You will be notified about new contests. Watch, Practice and Master the skill. 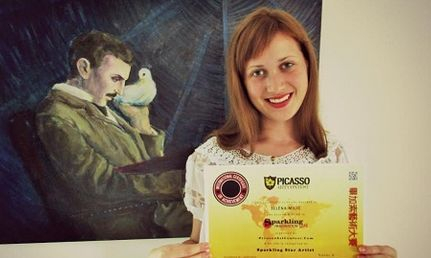 Thank You Picasso Art for choosing me as a STAR Artist. I really appreciate the beautiful certificate and will treasure it. Taking part in this contest has been a very happy experience for me. I am so glad that I'm a Star Artist. Be sure I will show to all my friends , teachers and relatives because it is a great opportunity for me.I'm very happy. Taking part in the contest has been a wonderful opportunity. I've been doing art ever since I could write my ABC's but I never got much recognition for it and because I won the Golden Artist Award in the contest, if anyone asks me what is your talent, then I can say that I really love doing art and show them my beautiful certificate! Congratulations!! 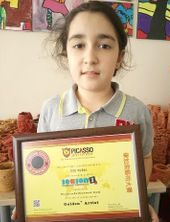 to all awarded students for great success in Season 2 of Picasso Art Contest 2015. Participants are from various countries including USA, INDIA, UK, RUSSIA, CANADA, UAE, CHINA, BANGLADESH, PAKISTAN, ISRAEL, IRAN, MALAYSIA, ROMANIA , NIGERIA, INDONESIA, SRI LANKA, JAPAN, BULGARIA, UKRAINE, FRANCE, PHILIPPINES, TURKEY, SERBIA, IRELAND, LITHUANIA, AZERBAIJAN, VIETNAM, REPUBLIC OF MACEDONIA (Europe), SPAIN, FIJI, JAMAICA, PORTUGAL, SWEDEN, BOTSWANA, GAMBIA, UZBEKISTAN, PALESTINE, QATAR, BAHRAIN, MAURITUS, SOUTH AFRICA, CROATIA, PERU, MONGOLIA, MALTA, ETHIOPIA, GERMANY, EGYPT, LATVIA, SCOTLAND, BELGIUM, KAZAKISTAN, NETHERLANDS, GREECE, KENYA, BELARUS, DENMARK, GHANA, OMAN, BOSNIA AND HERZEGOVINA, JORDAN, SWITZERLAND, TANZANIA, CONGO, NEPAL, ESTONIA, MOROCCO, MOLDOVA, CAMEROON etc. 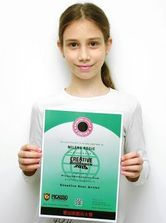 I’m Jelena Milić, born in 1998 in Zemun, Serbia. I go to the School of Applied Arts in Sabac, Serbia. The direction of conservator wall and easel painting. This contest is very interesting and important for me. Also, I think that's important to all young people, because it is a good support for children who are at the beginning of its creation.The theme of this contest is an exciting and wide. It provides complete freedom of expression.On this contest I've won Star Artist Award.